The first of February 2018 was unseasonably warm. A crowd of people had gathered outside the Jerusalem Theatre where Haim Gouri’s coffin was lying in state. White plastic chairs set out in rows on the sun-bleached plaza were filling up quickly, leaving a few hundred guests standing on the sidelines. A handful of Filipino care-givers maneuvered wheelchairs down the rows, pressed bottles of water into their charges’ hands, fanned them with rolled up newspapers. The mood was upbeat and nostalgic, the sense of camaraderie palpable. No-one complained about the heat. The crowd on the plaza was the liberal Ashkenazi elite who had built the country, designed its institutions and fought its wars. They had come to pay homage to a national hero. I watched the event from the back of the plaza, close to where the TV cameras were located, with tears rolling down my cheeks. A man recording the event put his arm around my shoulder and asked about my connection to Gouri. I admitted there was none. Not for the first time in my life, I felt like an imposter. I was in fact an imposter, riding on the coattails of other people’s grief, making it my own as I’d been unable to make my own grief my own. When we mourn we mourn for ourselves, for our own lives and our own losses. Haim Gouri’s obituary was in the paper that morning. The same morning I’d received the eulogy my sister had read at our father’s funeral earlier in the week. Gouri and my father were a year apart in age and died within days of one another. They belonged to the same generation, the generation that witnessed the Holocaust first hand, celebrated the birth of Israel, and gathered up orphans after World War II and sent them to Palestine. Wasn’t it because of my father that I made my first trip to Israel, inspired by his emotion whenever the country was mentioned or its national anthem played? Israel was about the only thing that moved him and which meant something to him. I was scared to look at him when news about Israel was broadcast on TV, because I feared he’d be crying. When photographs, documentaries or clips about the Holocaust were shown, I knew without a doubt he would be. I might not have known who Haim Gouri was had I not given him a ride home from Jericho almost three decades ago, when he flagged my car down on a dusty road not far from the Jerusalem-Dead Sea highway. He was standing in front of a small car that had smoke wafting out of its engine. His companion was still inside the car, a knee and an elbow jutting out from the open door of the driver’s seat. The two men, both in off-white trousers and loose shirts, climbed into the back of my hire car and introduced themselves. “Do you know who he is?” Gouri asked me, nodding towards his companion. This was my first visit to the country and I had no idea. “Uzi Narkiss,” he said. It meant nothing to me. “And do you know who he is?” the man who was Uzi Narkiss asked in turn. “Haim Gouri,” he said with a flourish. I was none the wiser. The two men talked all the way to Jerusalem. I didn’t understand a word, but they left a memorable impression on me. Affable, jovial, worldly. Later that evening I discovered that my two illustrious passengers were the commander of the Six Day war and the country’s national war poet. On that first trip to Israel I saw my father in every Israeli statesman, general, politician and actor of a certain age and background. In my daydreams, he was always heroic, beloved, successful, and charming. He was Ariel Sharon and Yehuda Amichai, he was Topol from Fiddler on the Roof and of course Jerusalem mayor Teddy Kollek; more modestly, he was the pastry-maker on Kibbutz Hazorea, where I picked melons and worked in the kitchen that first summer, a diver I met on the beach at Atlit, and the non-kosher butcher on Frishman Street in Tel Aviv. After my chance encounter with Gouri, my father was also the national war poet of Israel. The reality was far from the dream. I conflated the two because I wanted my father to be a hero, wanted to believe he was, or could have been, as great as the man for whom all these people were gathered. England, I always told myself, had been my dad’s undoing. All that formality, bad coffee, small talk and milk. Or the Kindertransport. Or the Holocaust. Marriage to my mother. A fear of the quotidian. None of the excuses I made for him really explained why he led the life he did, but they were necessary to protect myself from believing anything bad about him. Those excuses, so worn as to be threadbare by the time I was an adult, were trotted out on each occasion I felt let down and hurt by him. They were already too numerous to count when he was sent to jail when I was seven. My eulogy for him, read in my absence by a friend because of a final betrayal on his deathbed, persists with the excuse-making, the hero worship, the cover up. As I write this, approaching a year since his death, I can hardly bring myself to admit that the image so carefully constructed over the course of my lifetime bears little relation to the truth. Ten years after giving Gouri a ride home, I was commissioned by a British publisher to write a book about Israel, and flew out from London for a second time. It was an exciting period. The Oslo Accords had just been signed, Israelis were travelling to Jordan for the first time in decades and the Sinai was once again a safe destination. My book, a walking guide to the region, was literally going to be a trailblazer. In fact, it turned out to be a flop, because by the time it was published, in 1996, Baruch Goldstein had slaughtered 29 Muslim worshippers in Hebron, Rabin had been murdered and the Oslo peace process was dead. Tourists were avoiding the country and even locals weren’t hiking in remote areas alone. Still, the experience changed my life. It gave me an intimate connection to the land and its people and made me feel optimistic about what life had to offer. After the publication of my book I came back to Israel for a third time, this time permanently, got a job with the Jerusalem Post and started working as an editor. For decades Gouri lived in a modest flat a stone’s throw from the Jerusalem Theatre. The building has multiple entrances, a dark stairwell and a well-tended utilitarian communal garden. Whenever I passed I’d look up, hoping to spot Gouri. I never did. From the voluptuous plants on his terrace I imagined what the flat looked like inside. I’ve done that since I was a child. Made up stories about people’s lives from the faintest of clues, because a life without fantasy, my own life, was so grim. A painting glimpsed from behind curtained windows could set my imagination off. A fat cat on a windowsill, a man’s shadow, a coat on a hook, a cracked window, a potted plant. I imagined Gouri rheumy-eyed in an armchair near the window, smoking a pipe beneath a portrait of one of his children while his wife baked in a kitchen lined with cupboards of peeling wood. She was always baking. She made the scene feel cozy and intimate which was why it held such appeal for me. In my fantasy, homes smelled of baking and there was always food in the fridge. Some of what I imagined, like the rheumy eyes, I knew to be true, because Gouri and his wife weren’t complete strangers to me. The notion that all homes have food in the fridge I knew from experience to be untrue. Over the past decade I had seen the Gouris from time to time in a cafe where they and I often ate lunch. They always sat at the same round table, opposite the entrance, and from what I could see, always ordered the business lunch, and still gazed affectionately at one another after close to 70 years of marriage. No one paid them much attention. That’s how it is in Israel. They ate slowly, with easy silences and just as easy conversation. They dressed in the way Israelis dressed seventy years ago, not formally but carefully. By Gouri’s tenth decade his jackets hung off his pared-down form, and the chair he had once inhabited fully had begun, like his clothes, to look too big for him. Towards the end of his life, the table reached the height of his chest, and when he ate his elbows pointed upwards rather than downwards. When I last saw him, only months before his death, there was more Haim Gouri under the table than above it. Haim Gouri and my dad were born a year apart in different countries and in radically different circumstances. Both were sent to Europe after the war to locate orphaned Jewish children and prepare them for a new life in Palestine. Unlike Gouri, my father himself was an orphan at the time, having just discovered that his family had perished in Auschwitz. An orphan collecting up orphans. An orphan who wanted to start his own life anew in Palestine. Gouri lived in the country my father silently, passionately, yearned for. My father joined the Jewish Brigade when he was 17, fought at the side of officers from Palestine whom he admired and emulated, but he never became one himself. 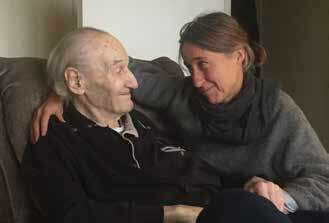 He was for a short while an undercover agent for British Intelligence, hunting down and soliciting confessions from Nazis hiding in Germany after the war ended, but that was the extent of his military career. A handful of people showed up on a rainy day in late January for my father’s funeral and fought at the graveside. There was so much shouting that my eulogy could not be heard. My sister chose to return to the graveside to read hers after the others had gone home, fearful of being interrupted and disgraced. No gravestone will be erected for him because the few people who care, his three daughters, have been cut out of the story. In his long and sad life, my father visited Israel only once, disastrously. He still has a bank account in my local bank. He opened it in my name and his, telling the bank manager he was coming out to live here and was about to send over a few million, but of course I knew, and maybe even he knew, that he wasn’t. He dragged me to estate agents in Tel Aviv and Jerusalem, asking them to show him the most luxurious properties on their lists because he would soon be retiring here. He took me to the best restaurants and to the King David pool and then asked to borrow some money so he could pay the bill. He wandered around Jaffa and impressed art gallery staff by admiring all the finest works and discussing whether to buy them or not. Margaret Tayar fell in love with him when we ate at her restaurant and he kissed her hand and told her he’d never eaten better anywhere. And left me to pay the bill. He exchanged our simple hire car for an Audi and ordered new furniture for my flat. He moved to the Hilton because my flat was depressing and he preferred Tel Aviv to Jerusalem, and flew home without telling me, leaving me to pick up the pieces and the tab. And now the bank manager won’t let me close the account because he doesn’t believe my father is dead. Haim Gouri was the person I would have liked my father to have been. If only things had been a little different, I told myself, Henry Kennedy, aka Harry Finger, aka Heinz Kuhe, would have been an Israeli national poet. Or if not a poet, then a general, or if not a general then a mayor, or if not a mayor then an actor, diver, chef or butcher. And in my wildest dreams, a father. Instead he was a tailor who turned to a life of increasingly audacious crime, spending more of his life behind bars than in them. He never ordered the business lunch anywhere, never gazed lovingly at his wife and penned little more than the occasional letter home from jail. He was of course charming, because conmen are, and he was funny and generous, at other people’s expense. He was a terrible father and husband. He betrayed those he purported to love and stuck by those he said he despised. He didn’t tell anyone he was dying because he didn’t think he was worth mourning, and, I suspect, because he knew that if we visited him in his final weeks, he would no longer have the strength to keep things moving along and the chasms in the facade would become too obvious. The consequences of a lifetime’s bad choices and cowardice would be, and in the event were, all too manifest. Prevented from attending my father’s funeral, I attended Gouri’s instead. There I said goodbye to my fantasy father, the hero and poet, the man loved by family and friends, surrounded by children and grandchildren, and to my real father, the man who was incapable of speaking up for those he loved and who died alone, haunted and lost, an orphan who didn’t trust a soul and was careless with his own. I cried for who I thought he could have been, for who he was, and for who I am now. It was good to have so many mourners at his final farewell, to hear such heartfelt speeches, to feel the love. For those short moments, I was surrounded by family and found myself wondering once again how things might have turned out differently had my father moved here and become Haim Gouri. Susan Kennedy is a freelance writer and editor based in Jerusalem, currently working on a memoir.